In Celebration of Modest Christmases Past When families had less, when America had less, a single gift could make a lasting impression. A long time ago in a country far, far away, America had less of everything and holidays were easier and more modest. 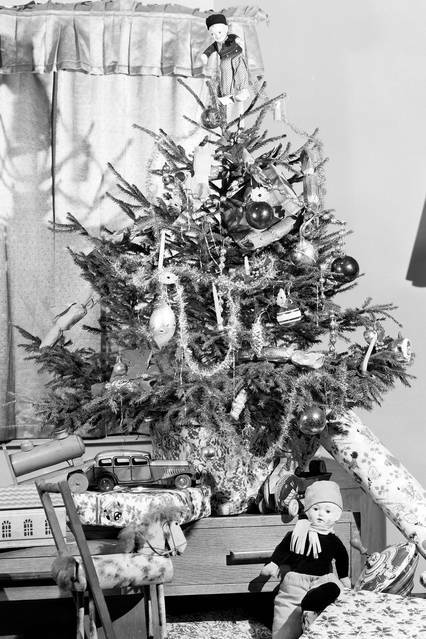 Only 50 and 60 years ago, well within human memory, Christmas was a plainer, simpler affair. Everyone—even the rich, but certainly the poor and in-between—had less. Because America had less. You’d get a sweater and socks instead of five toys, or five toys instead of 10. Technology was something that existed at places like NASA. No one’s wish list had a hoverboard, an iPad, or a brightly wrapped drone. There were more big families, whose children understood that even Santa couldn’t cover them all. You could make gifts. Or you could buy one after saving up, and the recipient could guess the sacrifice involved. And because there were fewer gifts, the one you got made a big impression. And so a nod to the more modest Christmases of years past. These memories came with a declared or implied, “We didn’t have much, but . . .” And this was said not with resentment or self pity but a kind of pride and wistfulness. Here is a friend of mine, from a large Irish Catholic family in New Jersey—seven kids, no money. She is in her 60s now, but still shy about revisiting those days. She doesn’t recall any specific gifts she received—“It wasn’t like we were going to get a smartphone, it wasn’t like that”—but she remembers the time the baby of the family, Cathy, age 5, let everyone know Santa was going to give her something very special. But Cathy wouldn’t tell anyone what it was. On Christmas Eve, her resourceful mother finally told her to write Santa a thank-you note and put it under the tree. She did, and later her mother peeked at the note: Cathy thanked Santa for the “bride doll” that he had hidden for her in the bookcase. But it was Christmas Eve—the stores were closed. After Cathy went to bed, one of my friend’s other sisters remembered a pile of old dolls down in the basement. “We found a doll, cleaned it, found a dress, washed and ironed,” my friend recalls. “We combed the hair, we gave it earrings and jewelry.” At dawn, Cathy ran down the stairs and found in the back of the bookcase the beautiful doll she knew would be there. My favorite gift of childhood was so surprising and moving and big. I was 9 or 10 and badly wanted a desk. I needed a desk because I had been selling neighborhood subscriptions to a local weekly newspaper called, as I remember it, the Massapequa Post. My success convinced me that I would someday be a great newspaper executive. I noticed in the old movies that played on channel 9 that what were then called career women—Rosalind Russell and Katharine Hepburn played those parts—often had a long, triangular nameplate on their desks. I made one for myself out of cardboard at school. Now all I needed was the desk. But such a piece of furniture was too expensive, too much to ask for in a family of nine. To be given a moment like that and take it through your life—that was some kind of gift. Will the New Year’s Tumult Trump the Old?